Sugar Sammy has once again extended his French tour by adding more shows in France and throughout Europe. His show is written specifically for European audiences and performed in pure, American stand-up tradition: a microphone and no holds barred! He’s performed over 170 sold-out shows in Paris since 2016, as well as 40+ shows touring the rest of France and Europe. 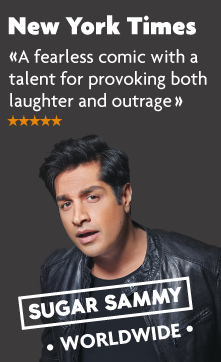 Sugar Sammy has performed over 1600 shows in 31 countries in English, French, Hindi and Punjabi. Come see France through the eyes of a world-travelled, Indo-Canadian.